Home Fly Fishing Are Beavers Good or Bad for Trout? It Depends. . . Depending on where you live, this guy could be a friend or foe. The Hendrickson spinners were just starting to descend on the Battenkill one calm evening last spring, and the river’s wild brown trout were ready. A good fish had begun rising just upstream, so I moved very slowly into casting position and then spent a couple minutes timing the rises, checking my knots, and planning the presentation. The light was fading fast, leaving time for just a few drifts over the trout, which was surely more than 20 inches long. I false-cast once, twice, and was preparing to lay the line out, when the water right behind me exploded with a tremendous concussion, startling me so badly that I nearly jumped right out of my waders, stumbling forward a couple steps. My line crashed to the surface in a heap, and my panicked reaction sent ripples up and down the pool, effectively ending any shot I had at the big trout. I turned to see a huge beaver circling back for another go. After a second tail slap for emphasis, he disappeared below the surface. Picture your favorite trout stream, and then imagine what it would look like after it has been dammed by beavers. These mental images can be dramatically different depending on where you fish. On a high-gradient mountain stream, a beaver dam might create a nice pool where you’ll find deeper water and larger fish, but a lowland river might be turned into a shallow, swampy, and perhaps troutless mess. This is what Doctor Williams means by “site-specific.” And whereas a fisheries manager in the Upper Midwest might spend a lot of time blowing beaver dams and relocating the animals, his counterpart in the Rockies might be spend his energies trying to attract beaver families to a watershed. 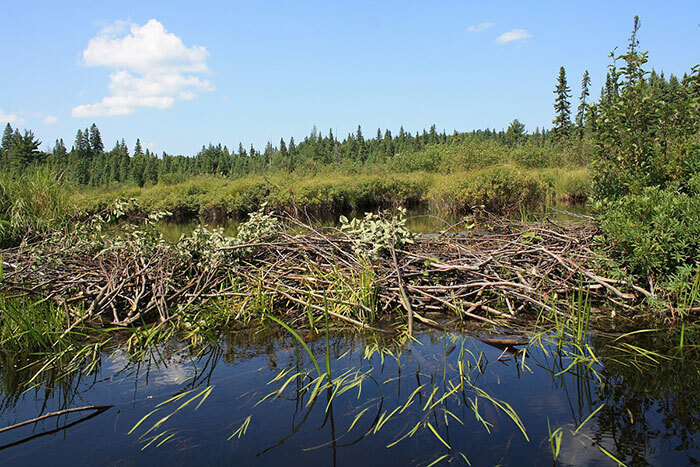 Beaver dams can help store water in a watershed, keeping water flows more steady during droughts. It’s worth remembering that beavers and native trout species (brook, rainbow, and cutthroat) evolved together in North America. Before Europeans arrived, the continent’s beaver population was an estimated 60 to 400 million—which means that the free-flowing rivers that we know today were probably much less common, as most would have had series of dams interrupting their flows. Unfortunately for the beavers, their pelts were in high demand around the globe, and by 1930, there were perhaps as few as 100,000 beavers left, mostly in Canada. As a result of trapping bans and restoration efforts, the beaver population has rebounded to between 6 and 10 million animals, which is still a small fraction of the original number. The Wisconsin effort is in part based the results of an 18-year project (1982-2000) by wildlife biologist Ed Avery, which studied the effects of removing 546 beaver dams from 32 miles of the Pemonee River and its tributaries. Avery’s findings were compelling: Summertime water temperatures were significantly cooler in 2000 than they had been in 1982; wild brook trout populations were 67% higher in spring and 17% in the fall; the average size of wild brookies increased from 7.6 inches to 8.9 inches; and the number of fish over 7 inches increased by an astonishing 311%. It’s easy to understand why anglers in the Badger State are in favor of keeping the number of beavers in check. But in the West, where drought is much more common, beaver-created ponds and wetlands can be important tools in the effort to manage water by holding as much of it as possible in the headwaters of river systems. Not only does a beaver pond serve as a reservoir, keeping vital snowmelt from running off too quickly, but the wetlands created by beavers can also serve to raise the water table—storing vital groundwater for the dry months ahead and supporting native streamside vegetation. On Nevada’s Maggie Creek, for instance, TU has been working with multiple partners for more than 20 years to restore Lahontan-cutthroat habitat. The arrival of beaver colonies, which were not part of the original restoration plan, turned out to be a boon to the project, as the wetlands created by dams made the stream more resistant to drought and wildfire and altered the runoff schedule to help trout survive the dry season. In some areas, beaver dams create fine habitat for bigger trout. On rivers such as the Upper Yakima in Washington, beavers are being reintroduced as a way to add “stream complexity” by creating deep pools, reconnecting channels, and introducing wood. This will help to provide better habitat for salmon-rearing, as well as slow down the runoff each spring. The importance of beavers to the Northwest’s ecosystem is reflected by a series of workshops—titled “Restoring Beaver to Restore Rivers” and hosted by an advocacy group called Worth a Dam—that were held last year in four cities from Northern California to Southeast Alaska. It seems that in almost every situation, where the beaver taketh away he also giveth. When a beaver cuts down streamside trees, which provide vital shade, the water temperature may rise slightly because of increased sun exposure. But those same trees and smaller pieces of wood that fall in the water can become important “cover”—fish-holding structure that offers protection from predators and a break from the current. The deep holes that form behind fallen trees offer a thermal refuge in times of low water and provide safe haven for young of the year and smaller fish, as well as habitat for larger fish. One final criticism of beavers that you’ll often hear is that their dams block fish migrations, which would be a real problem because we know how damaging blocked or perched culverts can be to both the distribution of trout in a stream and their ability to find good spawning habitat. However, a recent study by the U.S. Forest Service and several Utah universities found that, for species that evolved alongside North American beavers, the dams do not seem to be much of a problem a problem. After fitting more than 1,300 trout with PIT tags, the researchers were able to track almost 500 passes through or over dams. 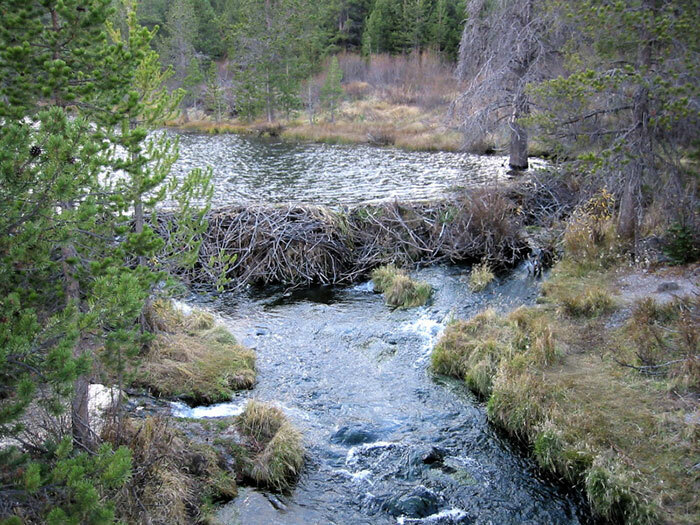 Cutthroat trout and brook trout were able to move through beaver dams relatively freely, but the movements of brown trout were somewhat impeded. As the effects of climate change continue to cause waters to warm and droughts to become more severe, our ability to manage this relationship will become increasingly important. In many parts of the country, restoring beaver wetlands will be the most effective and economically feasible method for protecting watersheds. What that means for trout will depend on a divergent number of factors, and both anglers and biologists will have to weigh all the pros and cons when deciding how to manage each stream. This story first appeared in Trout Magazine.